Sauerkraut is a superfood on its own, long known for its digestive, detoxing and immune boosting benefits. This recipe takes it to another level with the addition of turmeric, ginger and carrots: MORE SUPERFOODS! Turmeric has received a lot of attention lately with an emphasis on its ability to help your body fight inflammation. While the research is still in its infancy, cultures all over the world have been using it to promote healing for thousands of years. It also adds a unique flavor to your meals and a beautiful golden color as well. Ginger has also seen a rise in popularity in the last decade. Many people use ginger to help with nausea, motion sickness and even morning sickness associated with pregnancy. It’s also known for its ability to help with digestion and stomach upset which is why many tea companies sell an after dinner tea containing ginger. 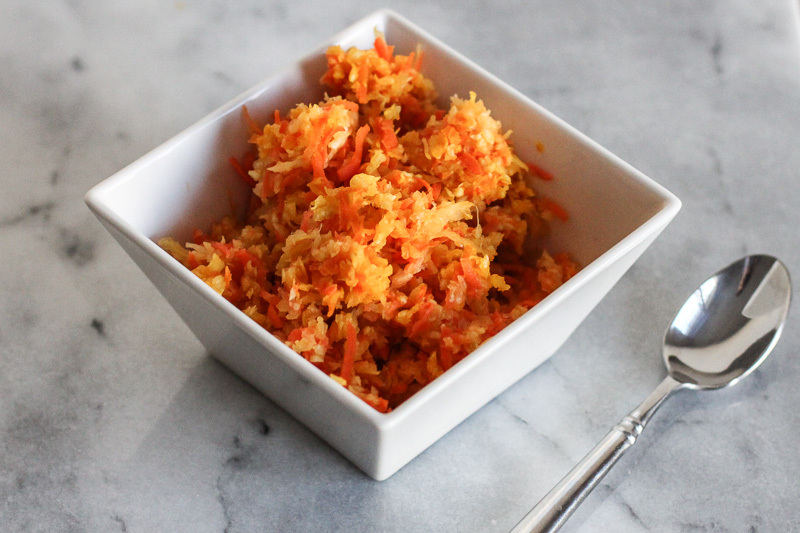 Carrots might be the most popular superfood in this recipe and that’s because they contain beta-carotene. Our bodies use beta-carotene to make vitamin A; which among other things, helps maintain healthy eyes. Though the superfood benefits of these foods are exciting, the taste is what excites me the most. 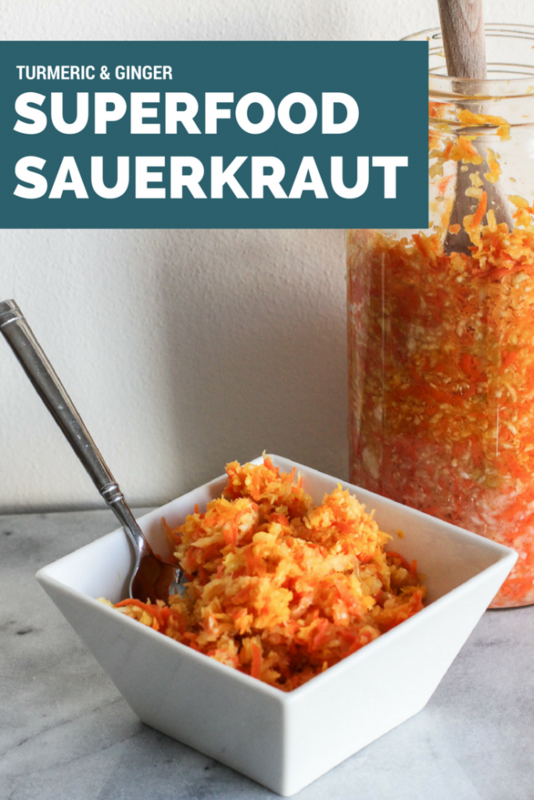 I think you’re going to love this Superfood Sauerkraut! Enjoy! First, remove the outer leaves and core of the cabbage and set aside for later. Then, peel the carrots and trim off the ends. Now it’s time to shred the cabbage and grate the carrots. I actually used a food processor for this but it can be done by hand as well. I find the food processor saves a lot of time, especially when it comes to the carrots. Next, put the shredded cabbage in a large bowl or pot and sprinkle with sea salt at a ratio of 1 tablespoon salt to 1 3/4 pounds cabbage. Massage the cabbage until it begins to sweat and liquid is noticeable in the bowl. Then add the grated carrots to the shredded cabbage and sprinkle in the ground turmeric. Mix to combine! Now, you’ll need to pack your mixture into the jar. Be sure to pack it down really well as to not allow for any air pockets. Throw in some grated ginger every so often so it’s distributed throughout the jar. Then cover with a glass weight or the outer cabbage leaves topped with pieces of the core. 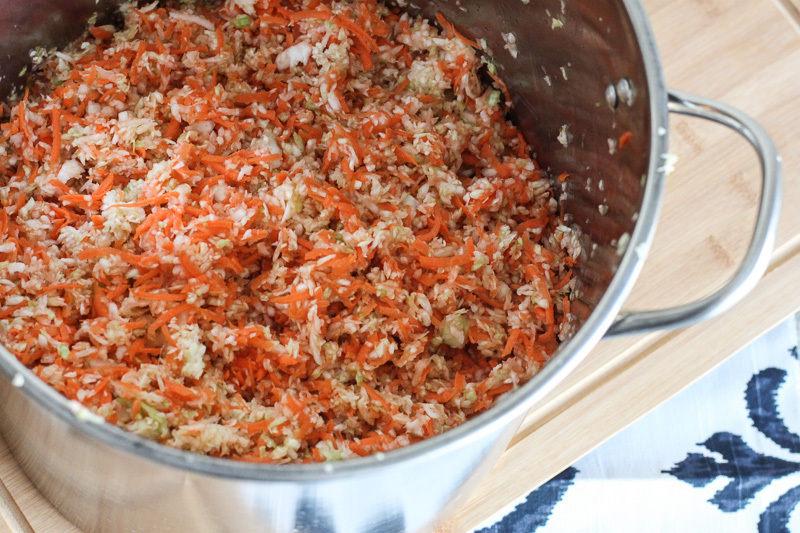 Be sure the cabbage and carrot mixture is under the brine! Then cap your jar and allow to ferment at room temperature. You can use a regular lid but you’ll need to ‘burp’ your jar at least once a day for the first 4-5 days. Be sure to put the jar in a bowl during this time in case you experience any liquid overflow. This will subside sometime during the first week. I recommend using an airlock type device so you are creating a true anaerobic environment for your ferment. 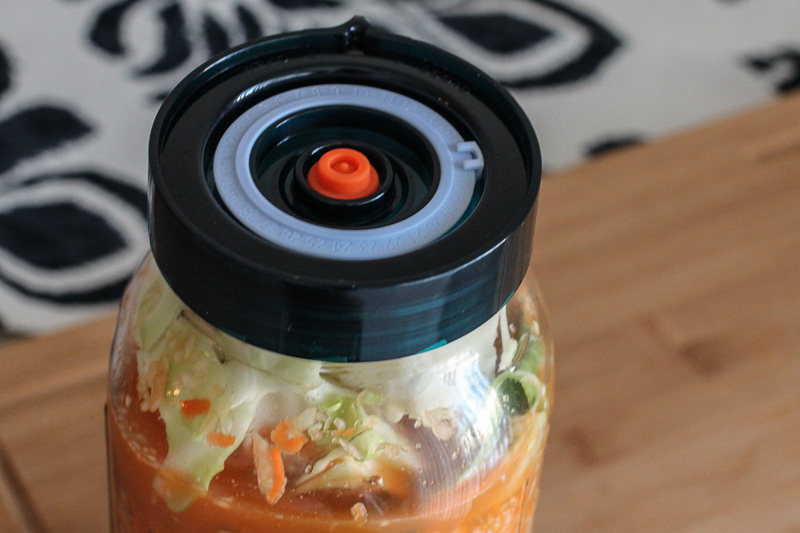 For this recipe, I used the Easy Fermenter lid. It’s an all-in-one lid and airlock. These work great for me and as a bonus, they are easy to open once your sauerkraut is ready to eat! 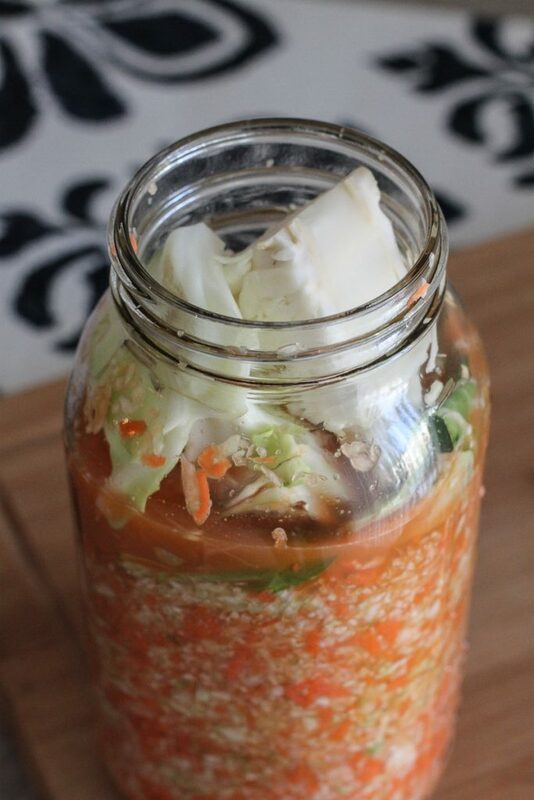 Let the superfood sauerkraut ferment for 14-30 days. 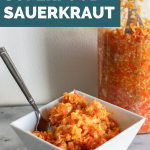 If it’s your first time making homemade sauerkraut, taste it at 14 days and see what you think. You can always close it back up and taste it another week later and another week after that! Eventually you’ll learn the length of ferment you prefer. For me, it’s right about at the 30 day mark. Once you like what you taste, move to the refrigerator and enjoy! Hi, This looks delicious. I intend to try tomorrow. Ginger and tumeric are my favorites. The recipe above calls for a half quart jar. Is that a typo? That seems small. Shouldn’t it be a half gallon jar? Thanks so much for such an informative, attractive website! Yes! Half gallon! I will edit now, thank you! Don’t you need pepper whenever you use tumeric for it to be beneficial? Hi Gaye, there is research pointing to black pepper helping to absorb turmeric so you could definitely include that in this recipe. Consuming with fat is another option. I usually have my sauerkraut on the side of something offering good fat.